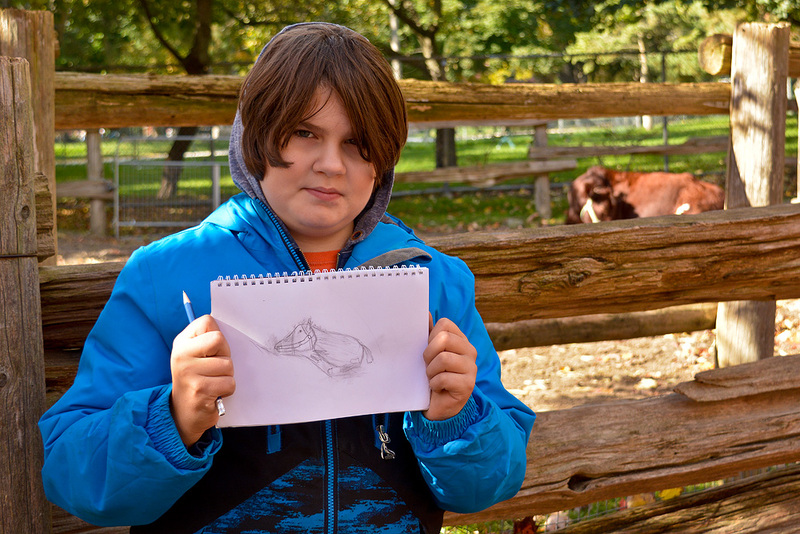 The Jr.NS artists experienced the feeling of the countryside this week as they spent the day sketching at Riverdale Farm. Ontario’s rural landscape is celebrated in many of Robert Bateman’s paintings and Riverdale is a splendid example of life on the family farm. Veterinarian Dr. Judy Brown was our guest speaker this week and she had lots of cool things to discuss like the specialized digestive systems of Ruminants and how their four chambered stomach differs from the human stomach. Dr. Judy also touched on basic animal anatomy and highlighted the differences in skull shapes between species. Between those lessons, the young artists practiced sketching animals in motion which is challenging even for experienced artists. We ended the class with a lesson on Blind and Sighted contour drawing, which involves very slowly sketching the subject (in this case, Pine Cones) to develop the coordination between hand and eye. Thank you Dr. Judy for stopping in to chat with the Jr.NS artists, it was definitely a fun day at the farm!